Adolf F. Larsson was born October, 1851, in Sweden, and died November 26, 1907, in Rockford, Winnebago Co., IL, at age 66. Buried in Riverside Cemetery, Ironwood, Gogebic Co., MI. He is the son of John Swenson and Unknown. Frederika Mathilda Gustava "Thilda" Larsdotter was born September 17, 1851, in Varna Parish, Östergőtland Co., Sweden, and died April 15, 1905, in Ironwood, Gogebic Co., MI, at age 53. Buried in Riverside Cemetery, Ironwood, Gogebic Co., MI. She is the daughter of Lars Fredrik Nilsson of Grebo Parish, Östergőtland Co., Sweden, and Gustafva Wilhemina Ekman of Asby Parish, Linkőping District of Östergőtland Co., Sweden. Adolf F. Larsson and Frederika Mathilda Gustava "Thilda" Larsdotter were married July 3, 1880, in Ishpeming, Marquette Co., MI. Olga Marie Larson: Born June 11, 1882, in Ishpeming, Marquette Co., MI; Died October 20, 1965, in Rockford, Winnebago Co., IL (age 83). Buried in Arlington Memorial Park Cemetery, Rockford, Winnebago Co., IL. Married June 6, 1906, in Ironwood, Gogebic Co., MI, to Karl Ludwig "Carl" Swenson: Born October 25, 1879, in Rockford, Winnebago Co., IL; Died January 5, 1956, in Rockford, Winnebago Co., IL (age 76). Buried in Arlington Memorial Park Cemetery, Rockford, Winnebago Co., IL. 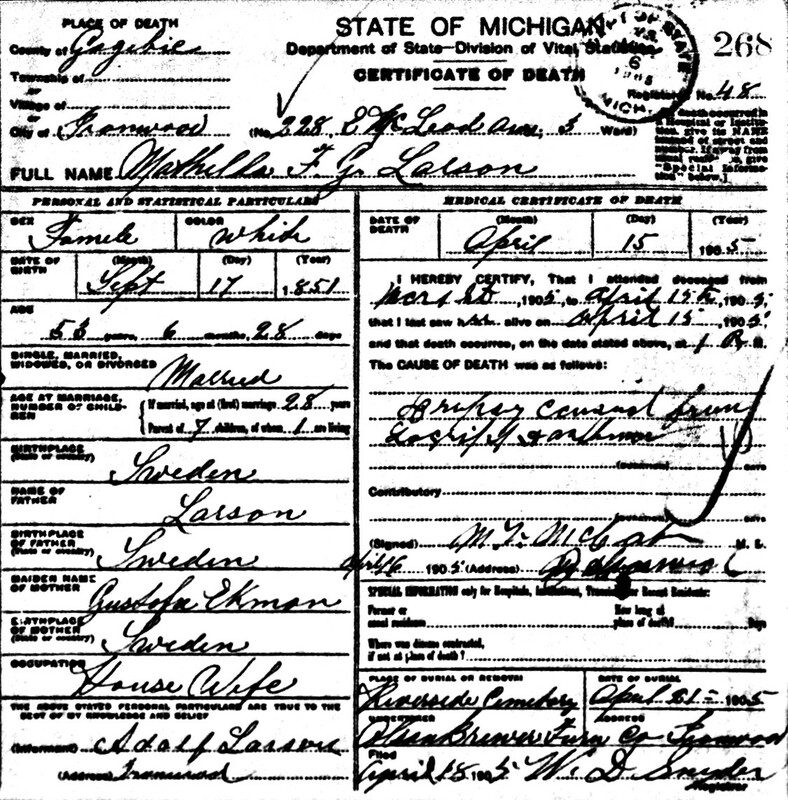 Unnamed Daughter Larson: Born May 26, 1885, in Ishpeming, Marquette Co., MI; Died May 26, 1885, in Ishpeming, Marquette Co., MI (Stillborn Infant). Frederika Mathilda Gustava "Thilda" Larsdotter was born September 17, 1851, in Varna Parish, Östergőtland Co., Sweden. Adolf F. Larson was born October, 1851, in Sweden. On May 9, 1873, Adolph Larsson emigrated from Åtvid, Östergötland Län, Sweden, to Marquette, MI, United States. He eventually became a naturalized United States citizen. In 1880, Matilda emigrated from Sweden to the United States. 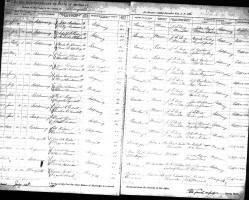 The 1880 U. S. Census taken June 9, 1880, shows Adolph Larson (age 28) born in Sweden to Swedish-born parents is an unmarried Miner, and is living in a boarding house operated by Sibert Forberg and wife, Ishpeming, Marquette Co., MI. 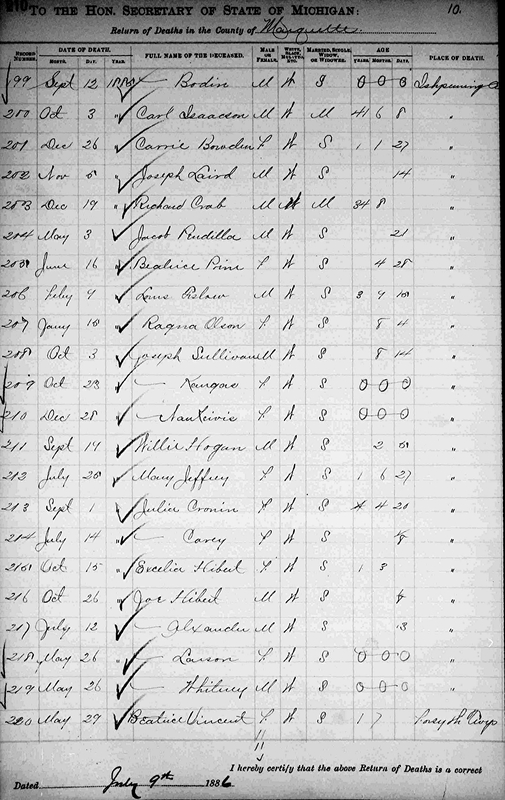 The 1880 U. S. Census taken June 9, 1880, shows Matilda Larson (age 28) born in Sweden to Swedish-born parents, is an unmarried Servant, and is living in a boarding house operated by Sibert Forberg and wife, Ishpeming, Marquette Co., MI. Adolf F. Larson and Frederika Mathilda Gustava "Thilda" Larsdotter were married July 3, 1880, in Ishpeming, Marquette Co., MI. 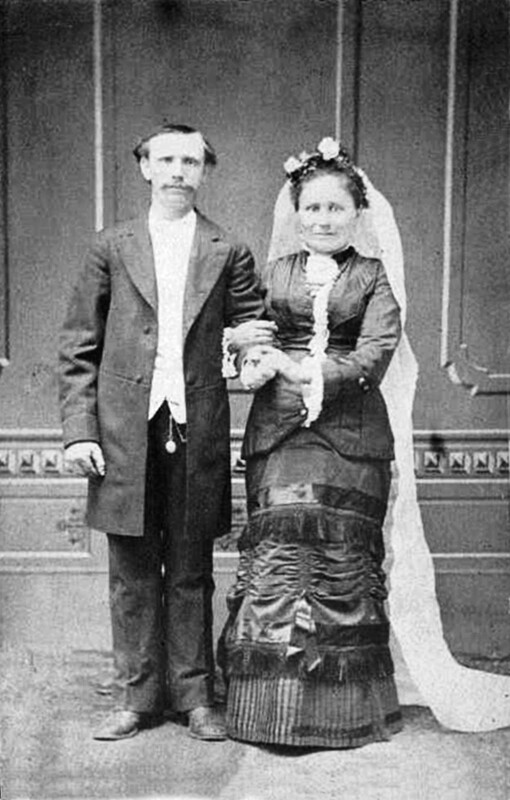 Adolf F. Larson and Frederika Mathilda Gustava "Thilda" Larsdotter Wedding Picture, 1880. The Marriage Report for Marquette Co., MI, shows Adolf F. Larson (age 28) born in Sweden, a Miner, and Frederika M. Larson (age 28) born in Sweden, were married July 3, 1880, in Ishpeming by J. F. Berg, Minister. Witnesses were Crobert Firberg and August Bjorling, both of Ishpeming. Unnamed Daughter Larson was born May 26, 1885, in Ishpeming, Marquette Co., MI. Unnamed Daughter Larson died May 26, 1885, in Ishpeming, Marquette Co., MI, at age Stillborn Infant. 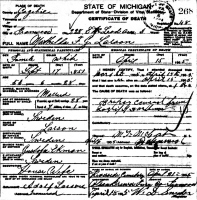 Unnamed Daughter Larson Death Records. 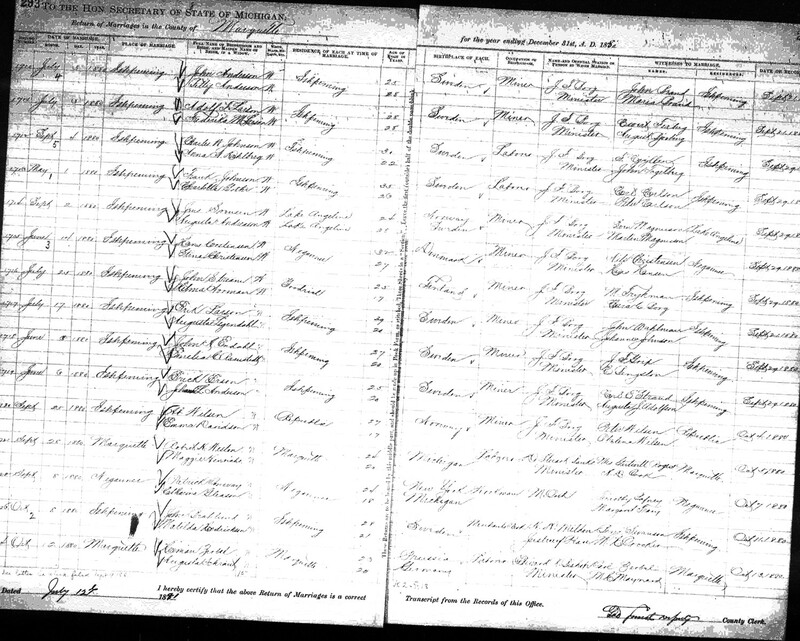 The 1900 U. S. Census taken on June 5, 1900, shows Adolph Larson (age 48) born October, 1851, in Sweden to Swedish-born parents, and having emigrated in 1873, and a Naturalized citizen, is an Iron Ore Worker owning his own home free of a mortgage, and is living in the 3rd Ward, City of Ironwood, Gogebic Co., MI. Living with him is his wife of twenty years, Matilda Larson (age 48) born September, 1851, in Sweden to Swedish-born parents, and having emigrated in 1880, with 1 of the 7 children born to her still alive. Also living there is his unmarried daughter, Olga Larson (age 17) born June, 1882, in Michigan to Swedish-born parents. Also living in the house are two boarders. Frederika Mathilda Gustava "Thilda" (Larsdotter) Larson died April 15, 1905, in Ironwood, Gogebic Co., MI, at age 53. Buried in Riverside Cemetery, Ironwood, Gogebic Co., MI. 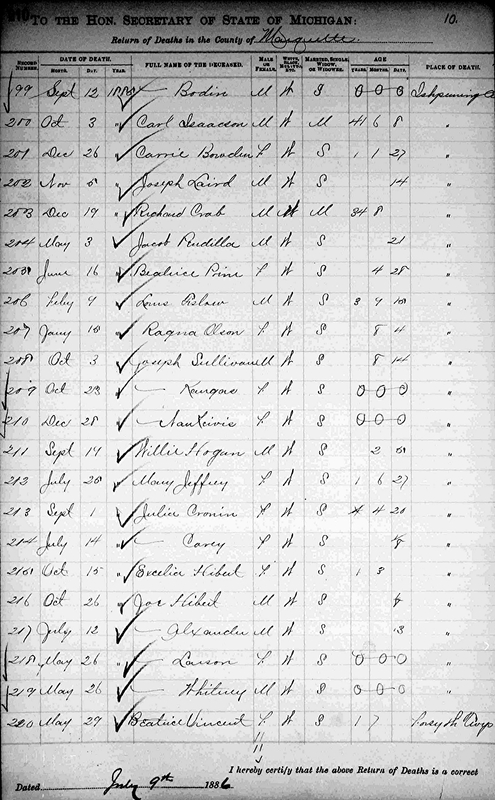 Frederika Mathilda Gustava "Thilda" (Larsdotter) Larson Death Record. Mrs. Matilda Larson, wife of Adolph F. Larson, died last Friday night at the family residence, 228 McLeod avenue. Deceased was fifty-three years old, and had been a resident of this city for a great many years. The funeral took place yesterday afternoon, and was largely attended. Services were held at the Swedish M. E. Church. Interment was at Riverside cemetery. Those who came here to attend the funeral of the late Mrs. Adolph Larson, held Friday afternoon, mention of whose death was made in these columns last week, were Carl Dahlberg of Chicago, a brother, Mrs. Louis Anderson of St. Paul, a sister, Mrs. Andrew Dahlquist of St. Paul, and Olaus Larson of Waupaca. Adolf F. Larson died November 26, 1907, in Rockford, Winnebago Co., IL, at age 66. Buried in Riverside Cemetery, Ironwood, Gogebic Co., MI. Adolph F. Larson, for many years a resident of Ironwood, died at Rockford, Ill., on Wednesday. Deceased resided in this city until a few years ago, when he went to Rockford to live with his daughter, Mrs. Ludwig Swensen. Mr. Larson resided at 228 east McLeod avenue, the residence at that number and the brick building adjoining having been built by him many years ago. Mrs. Larson died here some years ago. The remains will arrive in Ironwood today from Rockford, and the funeral will take place Sunday afternoon from the Swedish M. E. Church. Olaus Larson of Waupaca, Wis., attended the funeral of Adolph Larson last Sunday.